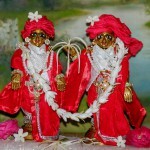 Question: I wanted to know whether your paramparā has any scope for Gaura Gadādhara upāsanā. We know that many of the Nadiyā bhaktas wrote songs in praise of them together. Bhaktivinoda Ṭhākur and some of his followers also had a focus on Gaura Gadādhara. The other thing is, does your paramparā think that Gaura Gadādhara worship is following in the mood of the Gosvāmīs, Kavirāja etc? There is some evidence that the Gosvāmīs accepted Gadādhara as Rādhā. But my specific question is if they worshipped Gaura Gadādhara together. In the majority of cases (padyāvalī/granthas) that I’ve seen, whenever they are together, Gaura’s Rādhā-bhāva does not flourish, hence my query. Hopefully the query makes sense. Answer: We are worshippers of Gaura Gadādhara and our lineage comes through Bhūgarbha Gosvāmī. It is not true that Gaura’s Rādhā-bhāva does not manifest in the company of Gadādhara. I don’t know from where you got this idea. Rather, it is just the other way around. It is for this reason that Mahāprabhu kept Gadādhara in Jagannātha Purī but asked Śrī Nityānanda Prabhu to preach in Bengal and to not visit Him. Mahāprabhu is called “Gadādhara-prāṇ” or “the very life of Gadādhara”. He is always with Gadādhara. If Rādhā-bhāva did not manifest with him, in whose company would it manifest? When Mahāprabhu wanted to travel to Vantāvan, He forbade Gadādhara to accompany Him so that He could travel and not be just absorbed in Rādhā-bhāva. Question: I’ve seen many instances where when they are together, Gaura’s Kṛṣṇa–bhāva manifests or Vraja-līlā manifests. 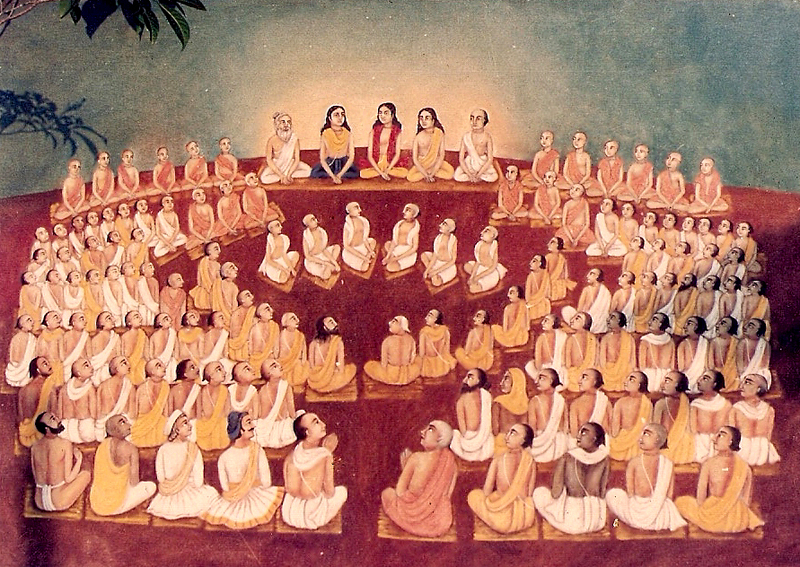 Or rather Gaura seems in a more generalized bhakti- bhāva. To illustrate that point further, in CC Antya līlā, when Gaura is succeeding more and more in his relishing Rādhā-bhāva, Gadādhara seems to recede more to the background, suffering separation in the temple of Ṭoṭā-gopīnātha. Instead, we find Svarūpa Dāmodara and Rāmānanda Rāya as Mahāprabhu’s companions at that time of his relishing Rādhā-bhāva to the higher limits. So although Gadādhara is said to be always with Gaura, we see his close association absent during the critical point at which Gaura tastes Gadādhara. Kavirāja Gosvāmī even excludes him from the 3 and a half intimate associates at that time. Answer: I would say that the reason for Śrī Gadādhara Prabhu receding is that his presence would incite Rādhā-bhāva more. He would act as uddipana vibhāva for Mahāprabhu. So he would stay away and suffer in separation. Moreover, Gadādhara himself would go into a high state of bhāva seeing Mahāprabhu and thinking of Him as Kṛṣṇa. 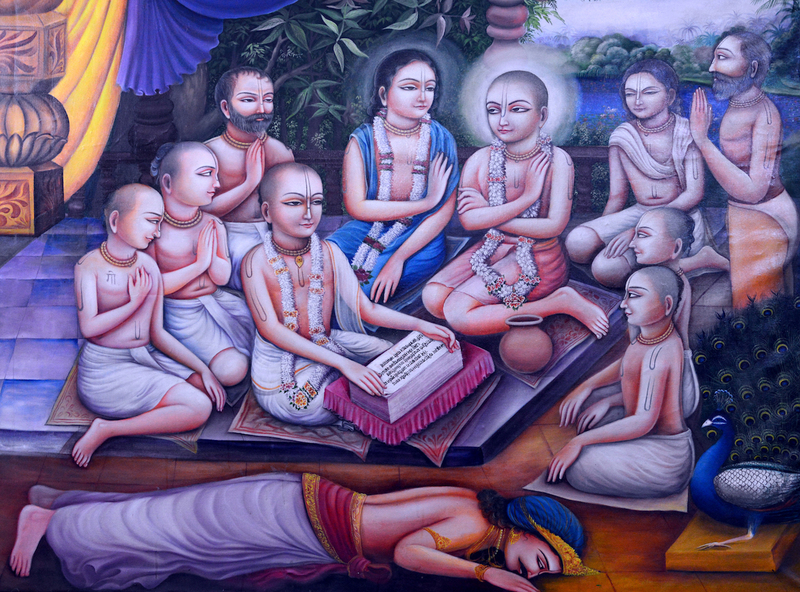 Already the associates of Mahāprabhu had difficulty in dealing with the mood of Mahāprabhu and trying to keep Him calm. If Gadādhara had also joined Him, there would have been double difficulty. Question: What is the difference between the worship of Gaura-Nitāi and Gaura-Gadādhara in terms of mood, qualification and goal? Answer: In the Pañca-tattva to the right of Mahāprabhu is Nityānanda who is non-different from Baladeva. Baladeva has sakhya-bhava along with vātsalya and dāsya. To the left of Mahāprabhu is Gadādhara Paṇḍita who is nondifferent from Rādhārāṇi. 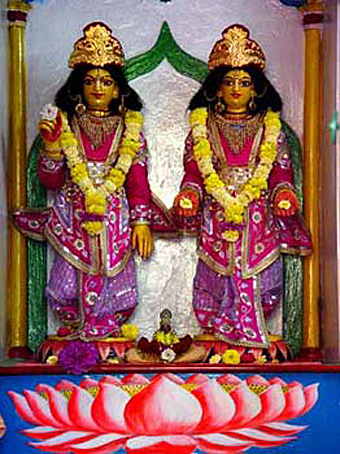 Śrīmatī Rādhārāṇī is the origin of mādhurya-rasa. Thus in Gaura-lila, Gadādhara Paṇḍita heads those devotees who are absorbed in the sweetness of mādhurya-rasa. So those whose goal is to achieve Kṛṣṇa-prema in mādhurya-bhāva worship Gaura-Gadādhara. Anyone who is chanting the Pañca-tattva mantra or worshipping the Deities of Pañca-tattva is naturally worshipping Gaura-Gadādhara. However, they may be doing it without specific awareness. 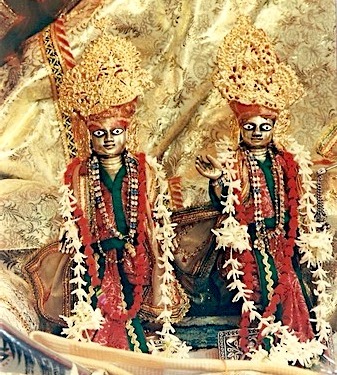 Gadādhar Paṇḍita has the greatest love for Mahāprabhu. His love for Mahāprabhu is categorically greater than even that of Nityānanda or Advaita Ācārya. This is the reason that among the Pañcatattva he is the constant companion of Mahāprabhu. 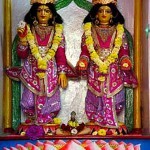 He is present both in Navadvīp as well as in Nīlācala–līlā. The reason is that he is nondifferent from Rādhārāṇī, the greatest lover of Kṛṣṇa. 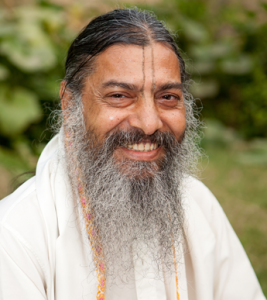 He is the personification of Bhakti-śakti. Sri Gadādhara Paṇḍita Gosvāmī is the foremost amongst Mahāprabhu’s intimate devotees. This however, does not mean that we should disregard the worship of Gaura-Nitāi or ridicule those who worship Gaura-Nitāi. Such a mentality is certainly hellish. Śrī Gadādhara Paṇḍita will not be pleased with such a mindset. This is the vow of Gadādhara: He would never see the face of one who offends Nityānanda. Gadādhara Paṇḍita would avoid being seen by anyone who has no love for Nityānanda Svarūpa. Whoever receives the merciful glance of Gadādhara can know Nityānanda Svarūpa. And whomever Nityānanda is pleased with can know Śrī Gadādhara. Read more about the role of Śrī Gadādhara role in the Gauḍīya sampradāya here on our website. ShistAcAra has been challenged due to lot of common men being exposed to the sampradaya.It is also natural to get eroded by time. These days internet is speeding this up and adding to a lot of confusion. Every individual has their opinion and version of what they heard. There can be regular meeting within branches of sampradaya to discuss on these internal things. Probably this is already happening . Good to bring these points for a bigger audience. Small observation – the enhanced picture of caitanya with gadhadhara swami reading SB does not show upavita on goswamis. I remember seeing it in original painting published in internet. I am aware that Nityānanda Svarup is acknowledged as the foremost bestower of Madhurya-rasa, and Radha dasya. 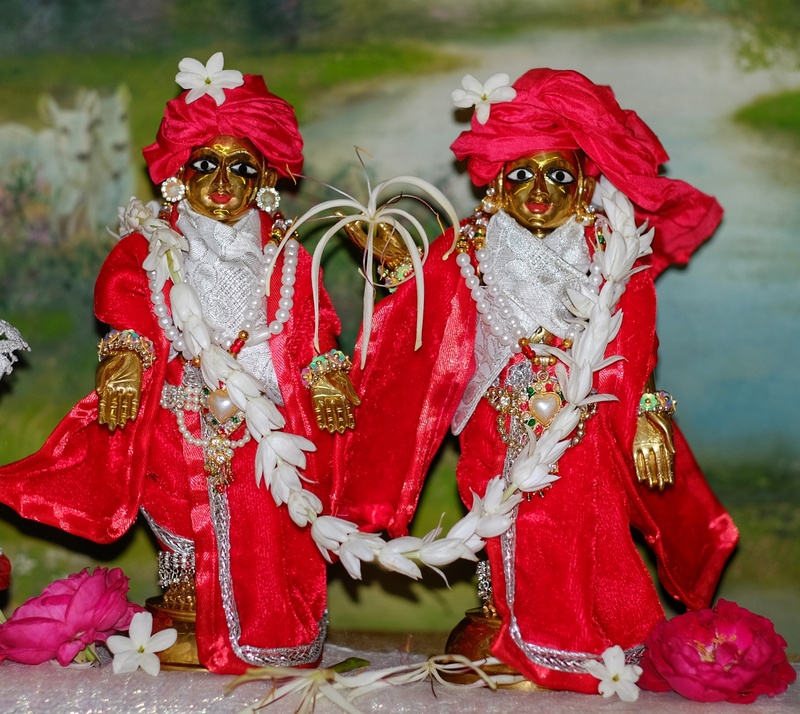 In these beautiful article we can realize Srila Gadādhar Pandit as receptacle. 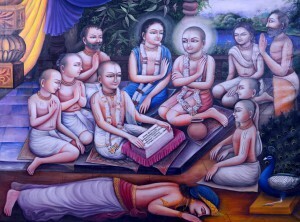 Nityānanda Prabhu is only mentioned as Srī Baladeva in the Sakhya, Vatsalya and Dasya bhavas. It could be interesting delving in this understanding much deeper.. having read the last quotes from Caitanya Bhāgavata properly. We can also realize that the relationship between both of them, Gadādhara and Nitāi is so excellent in regards to the fidelity to understand Gaura or Gaudiya tattva-siddhanta, one as giver and the other as the container both embellished with Gaurasundar! I questioned my self why is it then not mentioned Srila Gadādhara Pandit along with Nitāi Gaura Sitānâth as of one of the tin prabhus? Sri Sri Gaura Gadadhar Jayatah! Tamasic action is always taken out of delusion – without considering the consequences of how you will harm yourself or others.